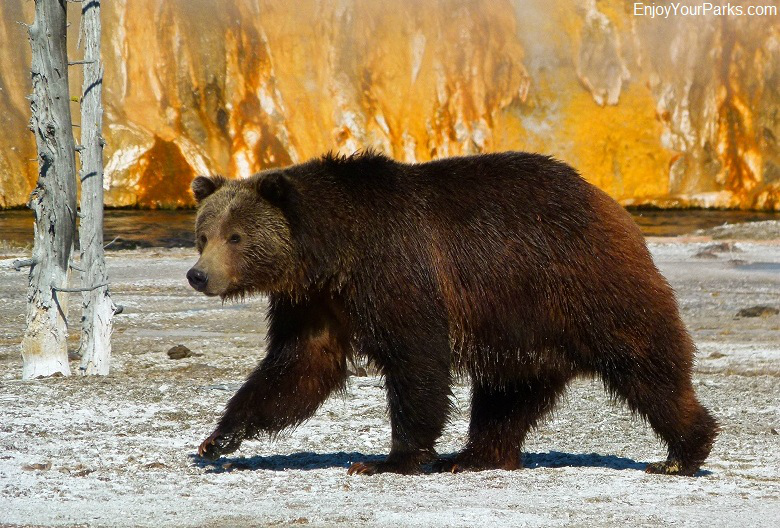 Grizzly bear walking across Black Sand Geyser Basin, Yellowstone National Park. 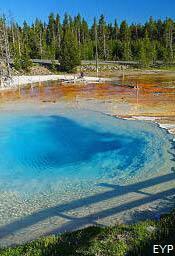 Sapphire Pool at the Black Sand Geyser Basin in Yellowstone National Park is appropriately named, wouldn't you agree? 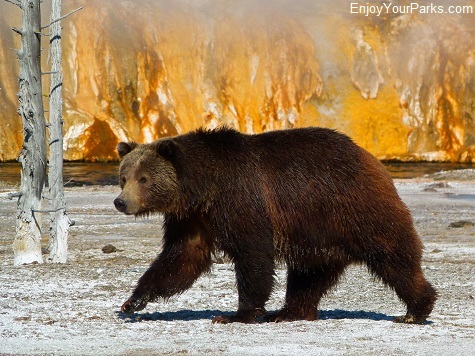 This grizzly bear walked across Black Sand Geyser Basin without a care in the world! 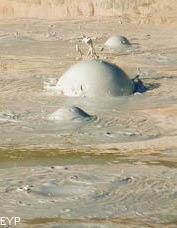 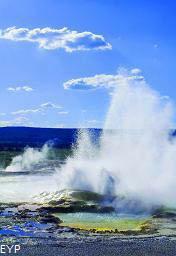 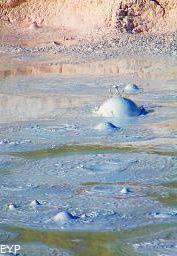 Geyser Row has an incredible variety of geysers, hot springs and mud pots that will absolutely astound you! 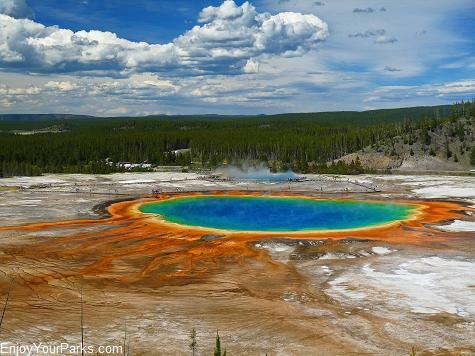 For example, Grand Prismatic Spring located at Midway Geyser Basin in Yellowstone National Park, is the largest hot spring in the United States, and the third largest in the entire world. 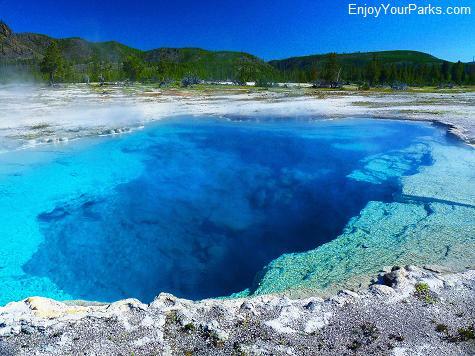 You MUST see this incredible hot spring- it's magnificent! There are many other iconic geysers and hot springs, such as the gorgeous Emerald Pool, Sapphire Pool and Excelsior Geyser Crater, just to name a few. 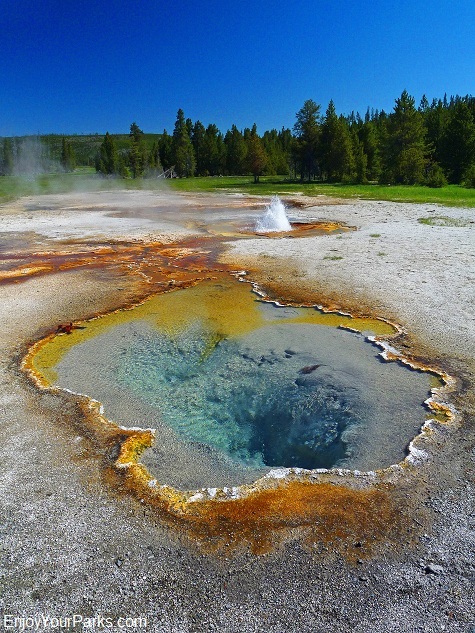 Each geyser basin, whether it be Black Sand, Lower, Midway or Biscuit Geyser Basin, offers its own unique hydrothermal features, and we strongly suggest that you explore all four of them! 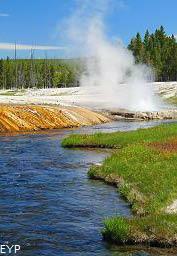 The Firehole River is one of the most iconic rivers in Yellowstone National Park, and it runs directly through Black Sand, Biscuit, Midway and Lower Geyser Basins. 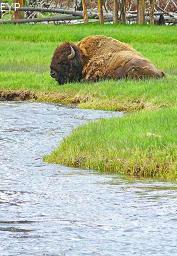 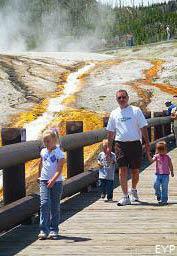 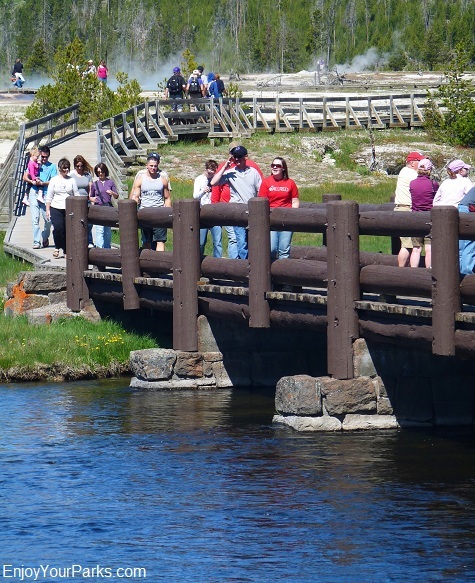 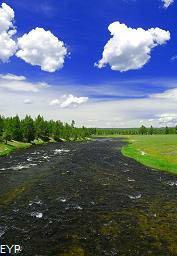 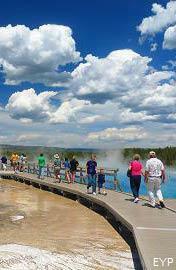 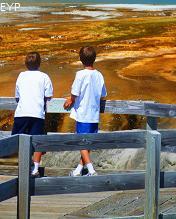 To reach Black Sand Geyser Basin, Biscuit Geyser Basin, Midway Geyser Basin or Lower Geyser Basin in Yellowstone National Park, you must cross the beautiful Firehole River via well built foot bridges. 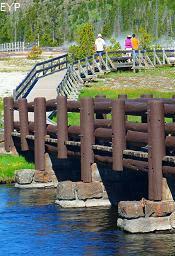 The views of the river from these bridges are terrific. 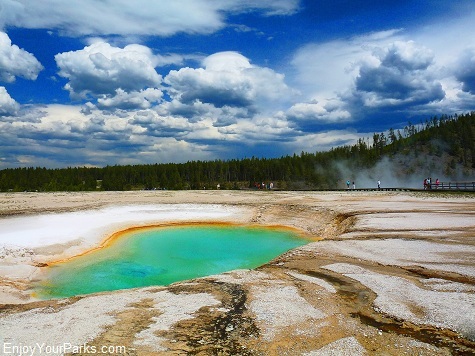 The Firehole River is one of the most famous and iconic rivers in Yellowstone National Park, and you'll really get a great look at it as you explore these geyser basins. 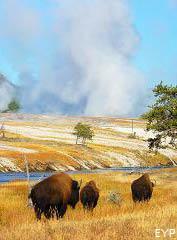 As you walk these boardwalks, you will more than likely see herds of buffalo either in the distance, or right up close and personal. 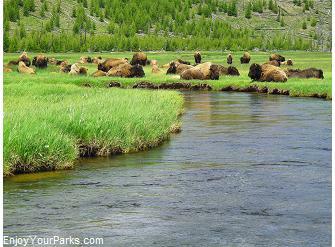 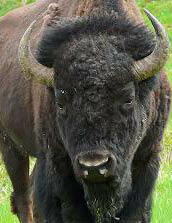 In fact, we've never been through these basins without seeing buffalo. 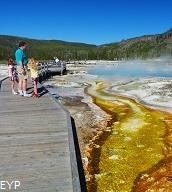 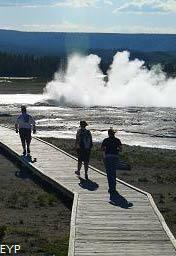 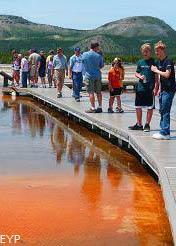 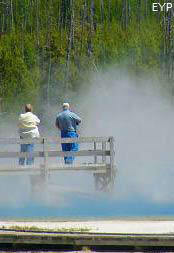 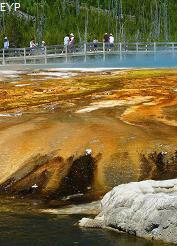 They are a permanent fixture to this area just as the geysers are. 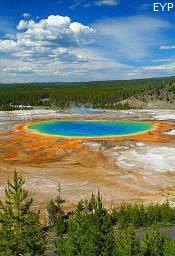 Opal Pool, Midway Geyser Basin, Yellowstone National Park. 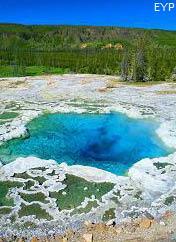 There's so much we could discuss with you concerning this amazing group of hydrothermal features, but you really just need to go there and begin exploring this magnificent area yourself. 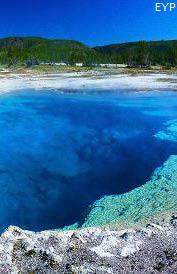 It's impossible to describe it so you've just got to see it! 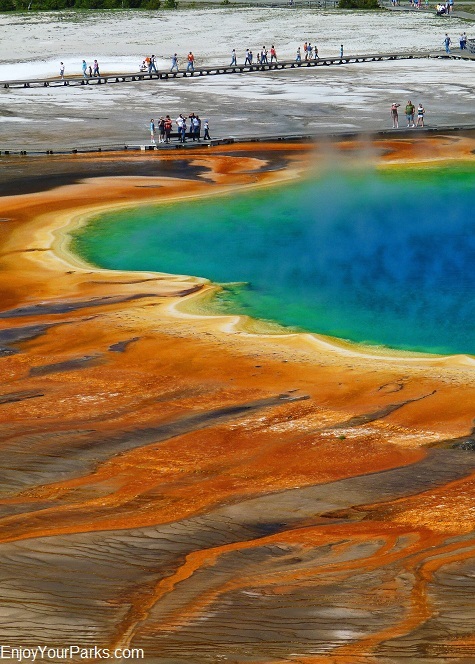 The colors that you'll see are spectacular, and the incredible size of some of these features such as Grand Prismatic Spring and Excelsior Geyser Crater will astound you! 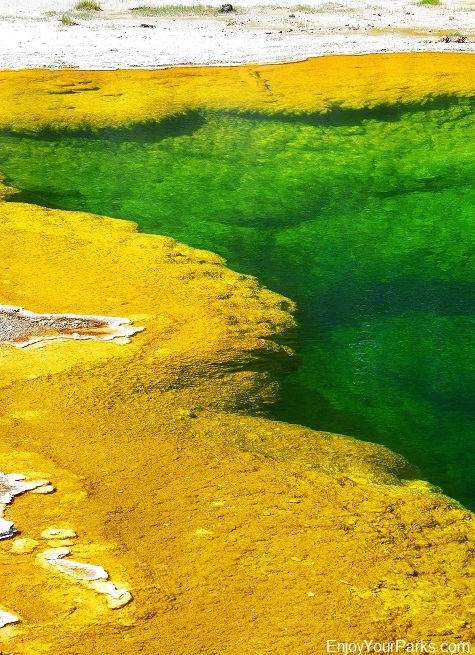 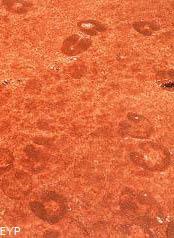 Again, our favorite Hydrothermal features are here, and we're confident you'll truly enjoy each and every one of them just as we do. 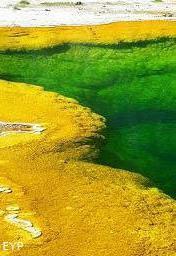 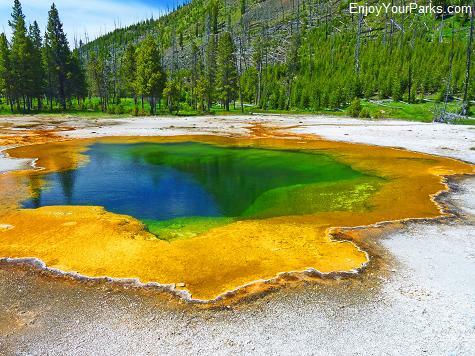 Emerald Pool is an iconic image of Yellowstone National Park, and is located at the Black Sand Geyser Basin. 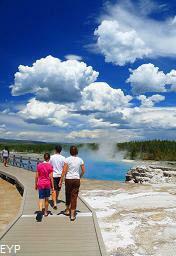 in Yellowstone National Park from the unmarked "overlook". 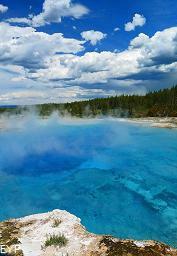 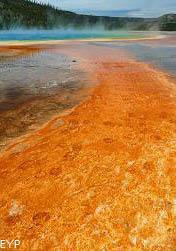 The above photo is a view of Grand Prismatic Spring at the Midway Geyser Basin in Yellowstone National Park from an "overlook" on the trail to Fairy Falls. 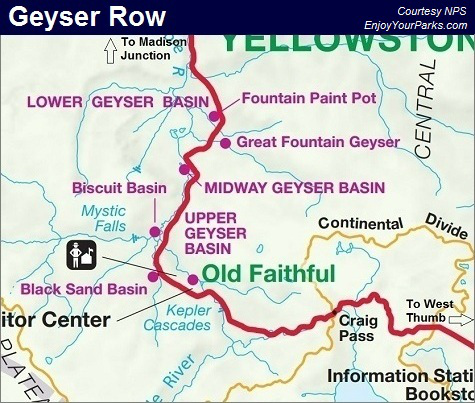 The trailhead is on the highway just south of Midway Geyser Basin. 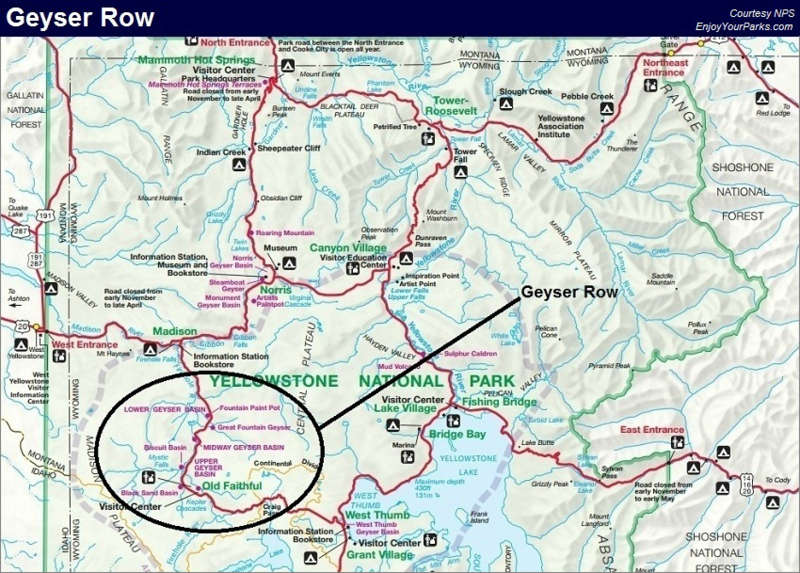 The "overlook" is not marked and there is no construction there, but as you walk towards Fairy Falls, less than a mile along the trail you'll see worn paths to your left that work their way up a steep hill covered in trees. 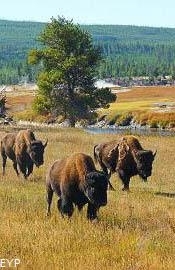 This is where the overlook is located. 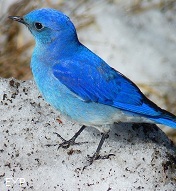 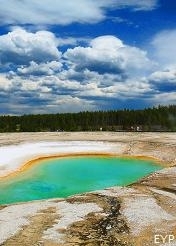 It's quite hard to find, but if you do find it, you'll be thrilled with the view! 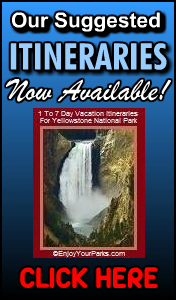 Because of the immense size of Yellowstone National Park, you'll still need a fair amount of time just to see the Top Ten, so make sure you check out our Informative E-Books which outline many Suggested Itineraries to help make your Yellowstone Park Vacation as enjoyable as possible. 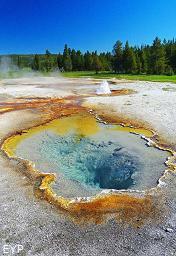 The iconic Emerald Pool at the Black Sand Geyser Basin in Yellowstone National Park is also very appropriately named! 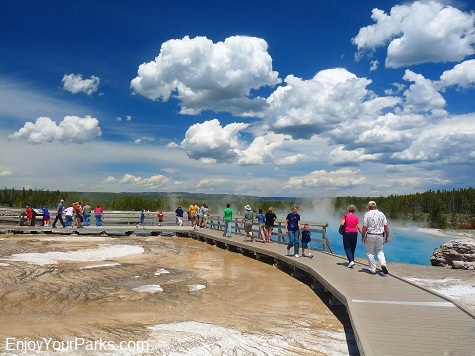 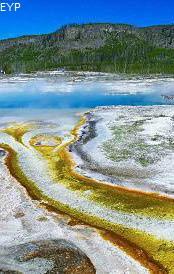 The Black Sand Geyser Basin, Biscuit Geyser Basin, Midway Geyser Basin and Lower Geyser Basin in Yellowstone National Park is definitely a MUST SEE on your Yellowstone Park vacation!!! 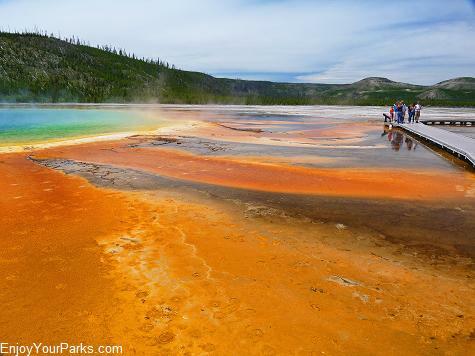 The colors you'll see along the boardwalks of Black Sand Geyser Basin, Biscuit Geyser Basin, Midway Geyser Basin and Lower Geyser Basin in Yellowstone National Park are astounding!